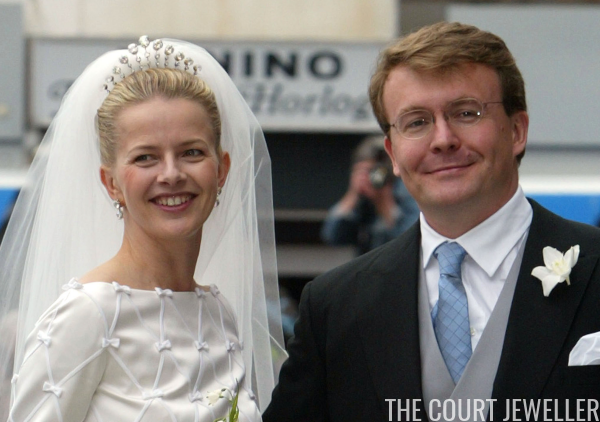 In 2003, the engagement of Mabel Wisse Smit and Prince Friso, the second son of Queen Beatrix and Prince Claus of the Netherlands, was announced. But soon after the engagement was announced, the couple's wedding plans were put in jeopardy. Because Mabel and Friso had failed to fully divulge the extent of her previous relationship with Klaas Bruinsma, a Dutch narcotics trafficker, the Dutch government refused to submit the couple's marriage to parliament for approval. Marrying without government approval meant that Friso would lose his place in the line of succession. But Friso loved Mabel more than the dim prospect of becoming king, and he announced that he would marry her rather than retain his place in the succession. Rather than becoming a Princess of the Netherlands, Mabel would become a Princess of Orange-Nassau. On April 24, 2004, Mabel and Friso were married in Delft. Mabel wore a bridal tiara retrieved from the very depths of the Dutch vaults. The all-diamond tiara features three rows of gemstones cascading down from a central high point in a way that echoes the shape of a kokoshnik. 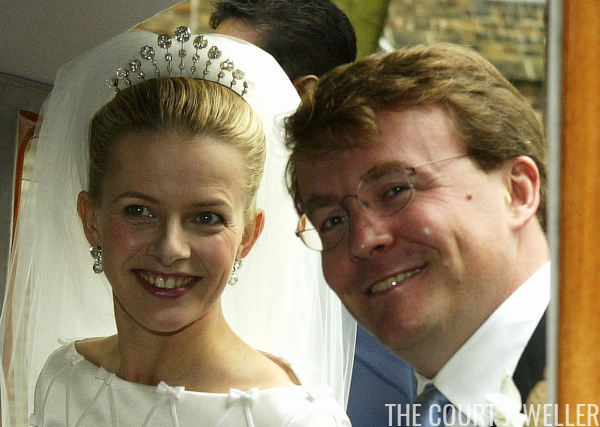 On Friso and Mabel's wedding day, the Dutch royal house put out a press release describing the wedding tiara as a "second setting" of the family's grand sapphire tiara. (You can read more about that tiara over here!) But subsequent research by jewelry historians, including Vincent Meylan, has shown that this isn't precisely the case. Mabel's tiara is actually a completely separate piece of jewelry. Made by Mellerio, it was purchased by the Dutch royal family in April 1888, during the reign of King Willem III. The tiara was originally a necklace, and it was set with both brown and white diamonds. But there is a link to the sapphire tiara: at some point, the brown diamonds were removed from the smaller tiara and replaced with the large white diamonds from the sapphire tiara. (There's apparently a screw mechanism in the piece that allows the stones to be swapped out fairly easily.) Today, it seems that the diamonds are used for both tiaras, which helps to explain why we've not seen the two tiaras worn at the same event. 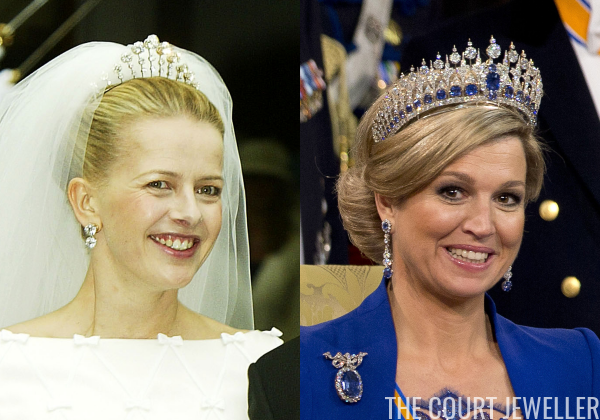 The comparison photo above shows the diamonds set at the top of each tiara. 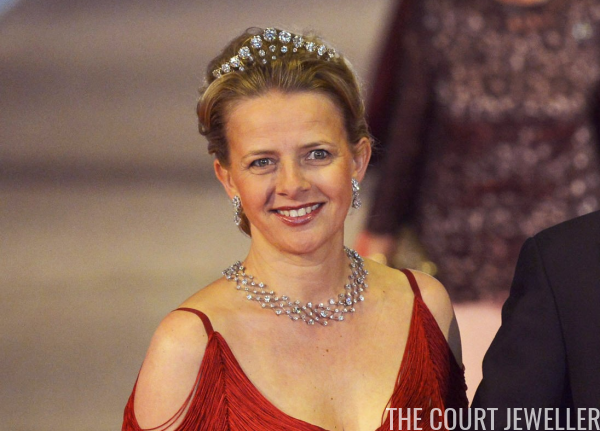 Mabel has continued to be the primary wearer of her bridal tiara in the years after her wedding, though Queen Maxima has also taken the tiara out for a spin. Although Prince Friso's tragic death still has lasting impacts within the Dutch royal family, Mabel still occasionally attends tiara events, and I imagine we'll continue to see her wear this piece from time to time.